Following the trend set by Robert’s recent book, Fit Fuel, the digital magazine serves as a guide to a healthy, balanced lifestyle and its content focuses on exercise, healthy eating, and motivation. It gives me a new way to reach my fans and I am looking forward to being able to provide information and inspiration each month. I want to help people make better choices—and be with them as they take their journey to a healthier, more fulfilling life. 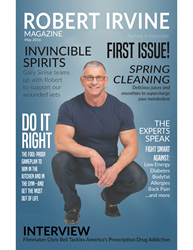 Robert Irvine has announced that he will be launching Robert Irvine Magazine today. Following the trend set by Robert’s recent book, Fit Fuel, the digital magazine serves as a guide to a healthy, balanced lifestyle and its content focuses on exercise, healthy eating, and motivation. This online publication will produce 10 issues per year. The magazine’s fitness section will include a question and answer section with experts addressing concerns from readers and fans, monthly workouts which will be scaled to tailor to men and women and fitness gear recommendations. Readers can also expect in-depth interviews; the first issue features sit-downs with Food Network All-Star Academy winner Natasha Clement (who teamed up with Robert to secure the victory in Season 2) and documentarian filmmaker Chris Bell, who has his finger on the pulse of American health. Continuing with the healthy lifestyle content, readers can expect to see new recipes and cooking techniques that will feature healthy, trending, and seasonal ingredients. Chef Irvine will also share his favorite kitchen gadgets and tips to make cooking fun and exciting for chefs of all levels. Highlighting Chef Irvine’s passion for supporting the men and women of our military, the magazine will often feature inspirational stories about military veterans and their families. The first issue features the story of Robert’s support for the Gary Sinise Foundation, which is changing the lives of wounded vets everywhere. With more than 25 years in the culinary profession, Chef Robert Irvine has cooked his way through Europe, the Far East, the Caribbean and the Americas, in hotels and on the high seas. As the host of one of the Food Network’s highest rated shows, Restaurant: Impossible, Irvine saves struggling restaurants across America by assessing and overhauling the restaurant’s weakest spots. Irvine was previously the host of Food Network’s Dinner: Impossible and Worst Cooks in America, has authored two cookbooks, Mission: Cook! and Impossible to Easy, and one healthy living book, Fit Fuel: A Chef’s Guide to Eating Well and Living Your Best Life. Irvine is currently on tour with his new, interactive live show Robert Irvine Live, and appears regularly as an expert guest on national morning and daytime talk shows. In 2015, Irvine launched Robert Irvine Foods, a company that features a nutritionally improved line of food products without compromising great taste. Irvine recently established the eponymously named non-profit organization, The Robert Irvine Foundation, in an effort to support military personnel and their families. Now in operation for a few years, the foundation continues to grow and assist those in need. In recent years he was honored with two very distinguished recognitions for his dedication to the armed services and our country’s heroes. He was first designated Honorary Chief Petty Officer by the U.S. Navy, and later that year awarded the Bob Hope Award for Excellence in Entertainment and Support of our Service Members - a distinguished Patriot Award bestowed upon him by the Congressional Medal of Honor Society. Continuing his support of the military, Irvine will soon become the first celebrity chef to open a restaurant, aptly named Chef Robert Irvine’s Fresh Kitchen, at the Pentagon in the summer of 2016. Also on the horizon for Irvine is the launch of the Robert Irvine Magazine in May 2016. For more information on Chef Robert Irvine, visit http://www.ChefIrvine.com.